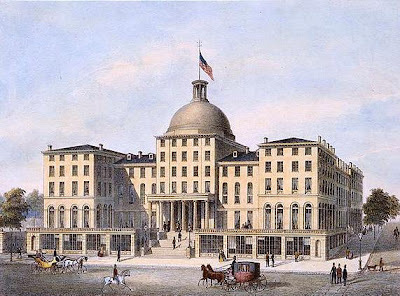 When the Burnet House opened in Cincinnati in 1850, the London Illustrated News called it “the finest hotel in the world.” Located on the corner of Third and Vine Streets, the five-story building was designed by architect Isaiah Rogers, already well-known for Boston’s Tremont House (1827), New York’s Astor House (1836), and the Exchange Hotel (1841) in Richmond. Crowned by a dome forty-two feet in diameter, the hotel featured panoramic views of the Ohio River and the Kentucky hills. 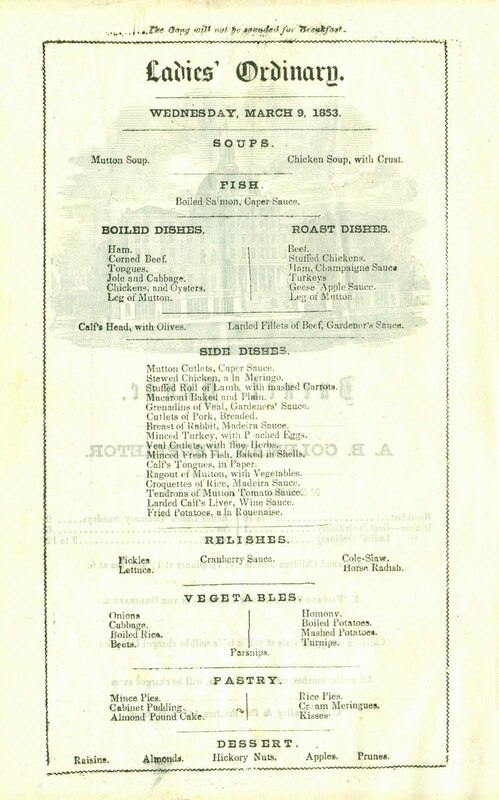 Large, ornate, and expensive, the Burnet House catered to a well-to-do clientele, as shown by two menus, one reflecting a passing social custom, the other reminiscent of a historic event for which the hotel would be long remembered. 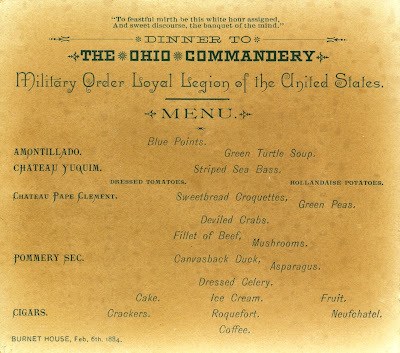 The dinner menu from 1853 shown below was printed for the “ladies’ ordinary,” the spacious dining room graced by four Corinthian columns, exclusively reserved for unescorted women. 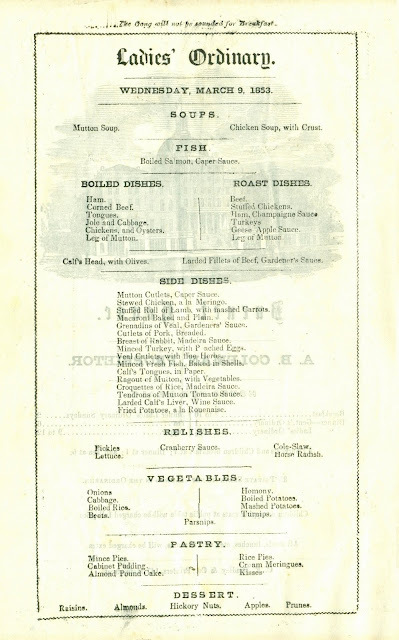 Nevertheless, the dishes on this menu were probably the same as those served in the hotel’s other dining rooms that day. 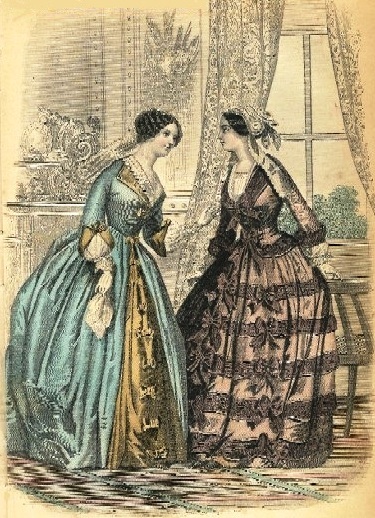 Although it is unclear when the ladies’ ordinary passed out of fashion at similar upper-class hotels on the East Coast, it seems to have been a somewhat old-fashioned custom by the mid-1850s. 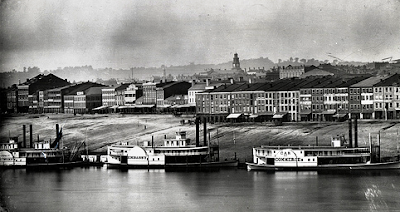 Called the “Queen of the West,” or by the less flattering nickname “Porkopolis,” a joking reference to its large hog-packing industry, Cincinnati was then the sixth largest city in the country, boasting a population of over 115,000 people. It was about the same size as New Orleans, ranked fifth according to the 1850 census, followed in ascending order by Boston, Baltimore, Philadelphia, and New York.1 Having already out-grown its early reputation for pork production, Cincinnati was a progressive city, distinguished by its role in the Underground Railroad, the network of secret routes and safe houses that helped slaves escape from the South. In fact, Harriet Beecher Stowe lived in Cincinnati until 1850, writing much of her anti-slavery novel Uncle Tom’s Cabin there. In its heyday, the Burnet House hosted many famous guests, including president-elect Abraham Lincoln who stayed there in 1861 on his way to Washington for the inauguration. In March 1864, Generals Ulysses S. Grant and William T. Sherman met in “Parlor A” of the hotel, spreading out their large maps in order to plan the final military campaigns of the Civil War. When visiting Cincinnati a quarter of a century later, Sherman recalled, “Yonder began the campaign. He was to go for Lee and I was to go for Joe Johnston. That was his plan. No routes prescribed...It was the beginning of the end as Grant and I foresaw right here.” Indeed, it was in Parlor A that Sherman’s "March to the Sea" was conceived, a military advance that cut across Georgia and through the Carolinas, spreading misery and destruction along its path. 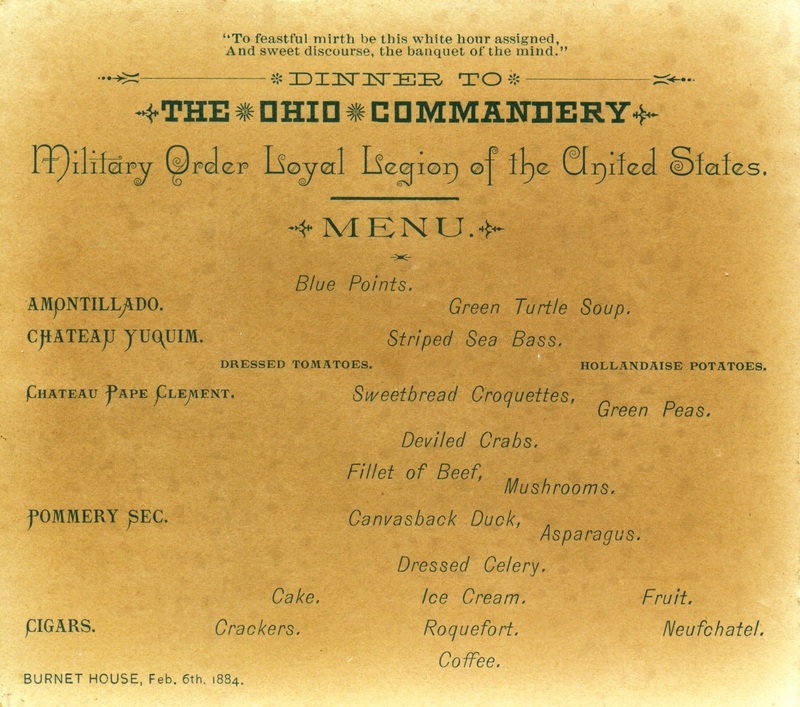 The elaborate menu shown below was right in step with President Hayes’ remarks about the hard-traveled road. Created by a local stationer named Peter G. Thomson, the bill of fare was placed in a miniature backpack of the type used by Union soldiers. Presented in a custom-made box, the backpack features realistic details like a leather flap, a wool bed roll, and a brass “U.S.” insignia. This charming memento has a toy-like quality, perhaps causing many of them to have been surrendered to grandchildren, making their survival as historical artifacts all the more improbable. The banquet includes green turtle soup, sweetbread croquettes, and Canvasback duck, all served with fine wines and champagne. After dinner, cigars were handed out to accompany the speeches, for this was the age of cigars, marked by the ritual pleasures of choosing, smelling, and rolling the unlit cylindrical roll of tobacco between one’s fingers, before finally lighting it. Cigars always appeared at the end of such dinners in the late-nineteenth century, causing clouds of smoke to be unleashed, its distinctive smell infusing even the best banquet rooms in the country with a lingering odor. 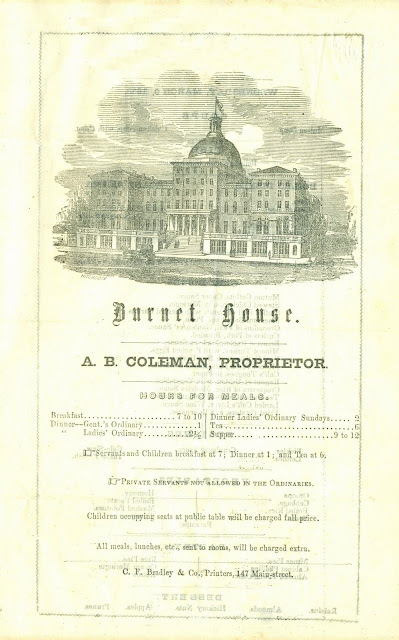 The Burnet House was beginning to decline by the time of this banquet in 1884, when its magnificent architecture was a remnant of a bygone era. 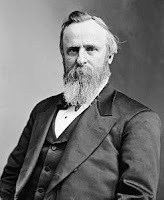 Certainly, the idea of the ladies’ ordinary was abandoned long before civil rights leader Susan B. Anthony stayed there in 1878. Still, some of the rooms were left unchanged, particularly the one where Lincoln slept, and the parlor where Grant and Sherman planned their campaigns, thereby ensuring that the hotel would remain a pilgrimage site. The old soldiers continued to meet at the Burnet, as did their male descendants after the organization was transformed into hereditary association, until the hotel was demolished in 1926. 1. The population of Philadelphia adjusted to include the adjacent Spring Garden neighborhood, now officially part of the city. Thank you for this post. I was researching a possible family member on the 1850 census in Cincinnati, and I could see she was a servant at a hotel but the name was unclear. Now when I look at the census record I can see that it is the Burnet House Hotel that is written in the margin. Louis Schultz, who had cooked in Baden Baden and had been hired by Lorenzo Delmonico in 1849, was secured as the inaugural chef of the Burnett House. 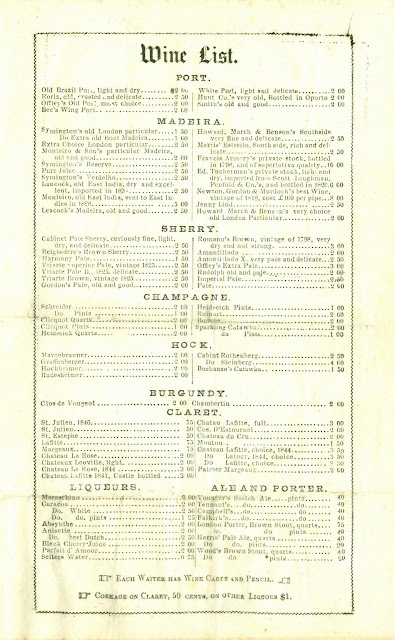 He no doubt prepared the menu/dishes in the first of your menus--the 1853 Ladies' Ordinary bill of fare. 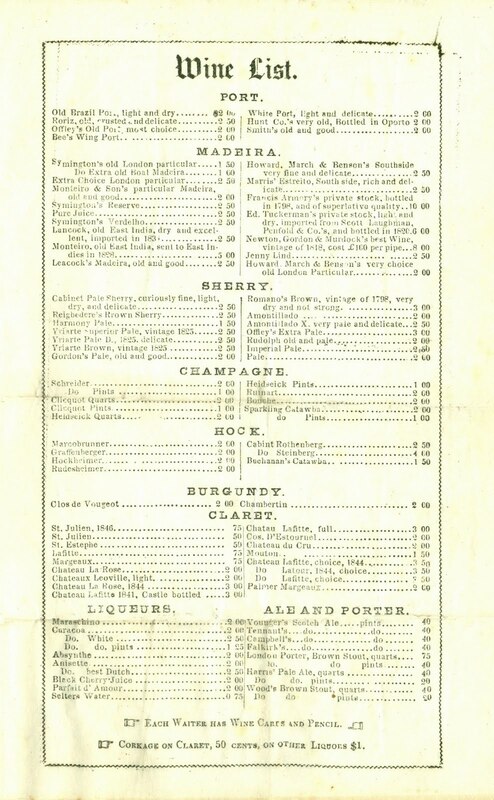 Schultz presided over the Burnett kitchens from 1850 to 1863 when Balthasar Roth poached him for his new St. Nicholas Restaurant. I found The Burnett House from a link to General Burnside who was there.I'm checking my ancestry because I'm a Rogers & am related to Burnsides. My great uncle's parents are buried outside of Dayton. Headstones are from 1824. They were originally from. West Virginia. Wow..this cool. Even more intreaging a Rogers was it's architect.